Tuesday I had the chance to visit a St. Paul gardening landmark — Terrace Horticultural Books, and for a reading gardener (or a gardening reader), this place is fabulous. Run by Kent Petterson, a retired electrical contractor and master gardener, the store houses about 15,000 volumes related to gardening. It’s located on the first floor of a charming Victorian house in a residential neighborhood and in the summer it is surrounded by gardens. Kent is something of a celebrity among gardening bibliophiles. Let’s put it this way: When Martha Stewart was in the Twin Cities, she went to Terrace Horticultural Books. Kent also has been a long-time volunteer for the Minnesota State Horticultural Society and I was visiting his store to take his photo for an upcoming article in Northern Gardener. While Kent dealt with a customer on the phone, I headed straight to the section with my preferred type of book — garden essays. There on the shelves were several of my favorites: Green Thoughts: A Writer in the Garden by Eleanor Perenyi, From the Ground Up: A Story of a First Garden, by Amy Stewart, and Two Gardeners: A Friendship in Letters, which is the collected correspondence of garden writing greats, Katharine S. White and Elizabeth Lawrence. I was able to stump Kent with one book, which is an all-time favorite of mine: A Full Life in a Small Place and Other Essays from a Desert Garden, by Janice Emily Bowers. He said he had not heard of it, but would look for it. 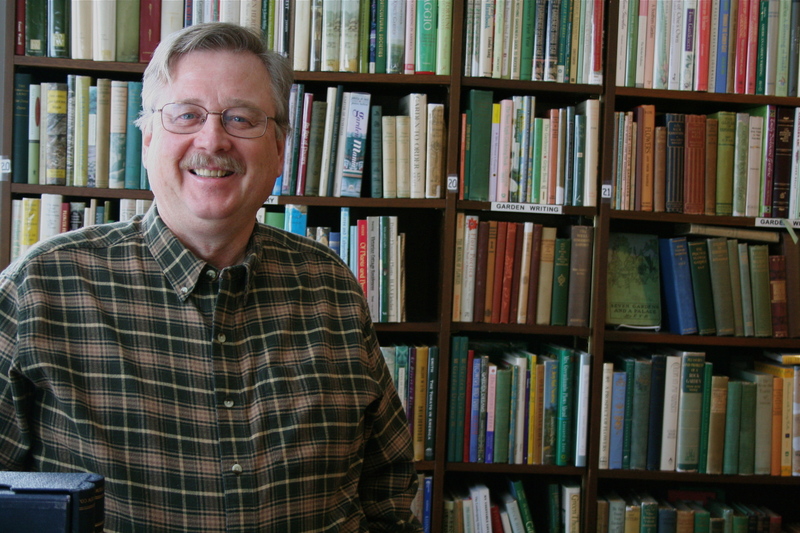 Like many used-book dealers, Kent does most of his business over the Internet. He has a large collection of garden books in German, which are popular with many overseas readers. He also has some interesting historical items, such as the little volume he’s holding in the picture. It’s the yearly reports and essays from MSHS in 1874. One tidbit I learned from Kent is the distinction between a rare book and a scarce book. If you check any of the used book web sites, such as Abe Books, and don’t find any copies listed, it’s a rare book. If you find a half a dozen or so, it’s merely scarce. 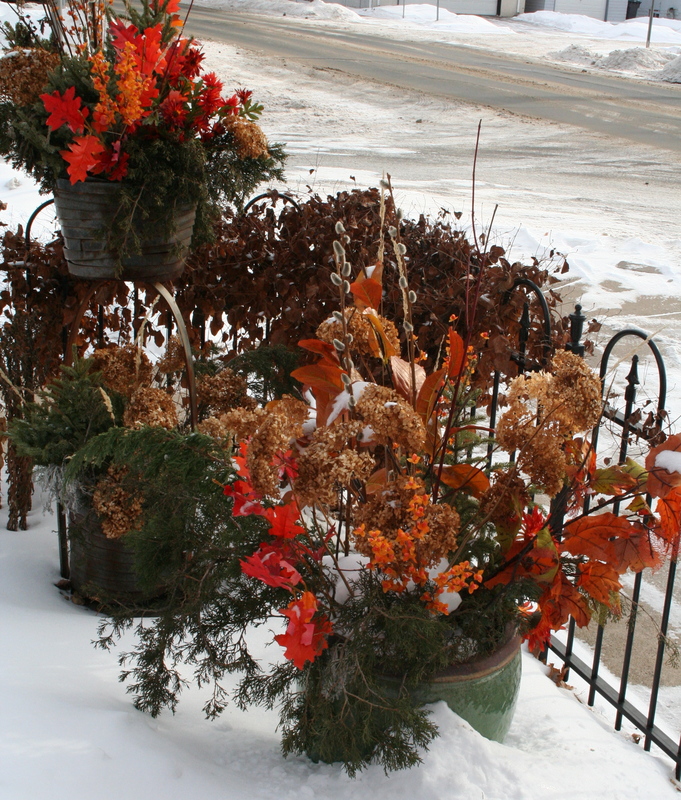 On my way out of the store, I could not resist taking a photo of Kent’s winter season pots. The orange is unexpected but a real eye-catcher on a frigid January day. I too love gardening essays and memoirs. I have From the Ground Up and a number of others (I feel a new blog post coming on, as I have more to say than properly belongs in a mere comment!). Thanks for the inspiration. And I will have to visit Terrace Horticultural Books. I had no idea that there was a bookstore devoted to gardening and the horticultural.